GREELEY – You have to go into the backyard to see Fritz’s carving. It’s carved into an old dead tree, standing in the back of Ellen McGurk’s and Doug Smith’s yard in northwest Greeley. 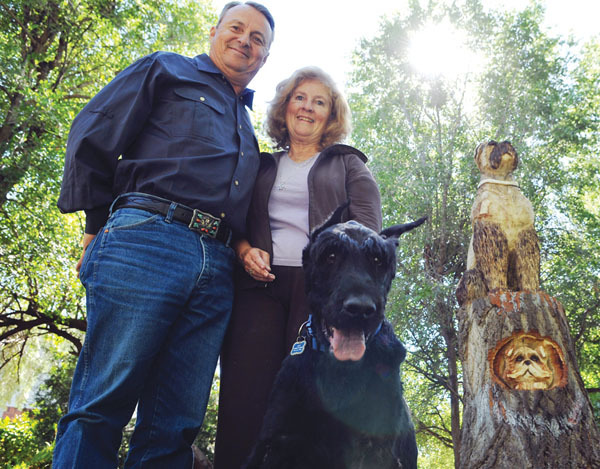 It’s a tribute to a giant schnauzer who has meant a lot to the couple, and, because of his age, won’t be here much longer. That’s why they hired Loveland artist Faye Braaten to carve the likeness of Fritz. The dog is a leaner. If you stand next to Fritz, he’ll lean into you. It’s what he does. He’s 12 years old now, and most giant schnauzers are gone by that age. In his prime, Fritz weighed 130 pounds. Today, he’s down to 80, and he can’t stand on his legs too long anymore. But he’ll still lean into you. Fritz is owned by McGurk and Smith, who have paid an unusual homage to their old companion. They had a tree carved in his image. They live in northwest Greeley, along 40th Avenue, where the trees are huge and the houses are few and the neighbors are close. It was odd that they ended up with the giant schnauzer. Fritz was one of nine puppies in a litter, but there was a disease, and he was the only survivor. The Smiths are both retired. Doug was an Air Force pilot and lieutenant colonel, then got his doctorate and was in charge of the Aims Fort Lupton campus before retirement. McGurk retired from the Metal Containers plant in Windsor. The couple have several dogs, including Fritz, a couple of poodles, a bulldog, a shih tzu, a malamute and “one we don’t know for sure,” McGurk said, laughing. Many of them are rescue dogs from the Humane Society of Weld County. And there are stories about Fritz. Now, at 12, Fritz is still friendly, still a leaner, but he’s slowed down. Then artist Braaten came to the couple’s house, met Fritz, was given a photo of Fritz in his prime, and went to work with her chainsaw. When she finished, the likeness to their dog was amazing to the couple. The carving even has Fritz’s lopsided ear. And, standing in their backyard, created from an old tree, the carving will always be a special memory for the couple. Even when Fritz is gone.